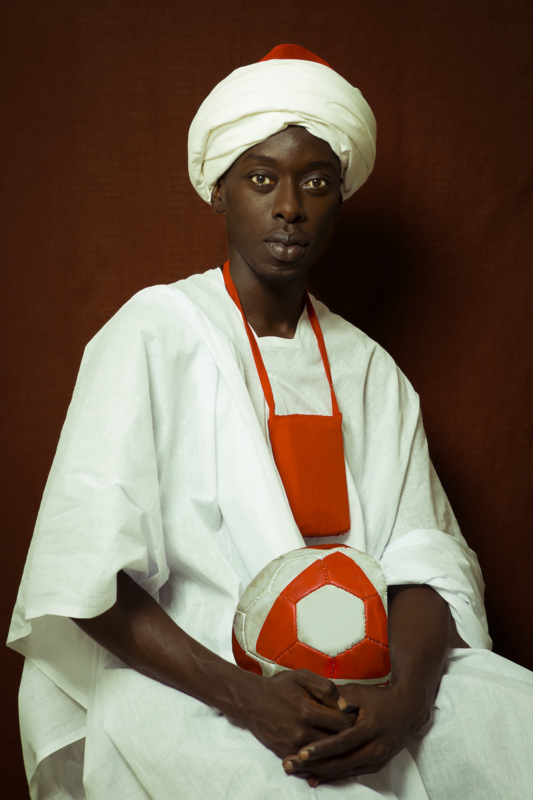 "Identity and discovery – at both the collective and personal levels – are themes in the forefront of Omar Victor Diop’s Project Diaspora. A journey through time, the photographic series delves into and exposes less spoken narratives of the role of Africans out of Africa. Choosing, for the first time, to use himself as object in his artwork, he has delved into the realities of being both narrator and character, forcing him to face his insecurities head on, and uses references to sport, football in particular, to show the duality of living a life of glory and recognition, while facing the challenges of being 'other'. Paradoxes he finds are shared between modern day footballers in Europe and the men of the original portraits depicted in his self-portraits.